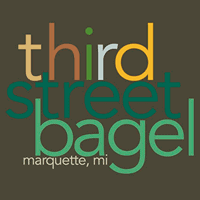 Third Street Bagel is a Marquette restaurant in the Upper Peninsula. Third Street Bagel Co. is a locally owned bagel and coffee shop in Marquette, Michigan. Our bagels are baked daily, soups & deli salads are homemade, & our coffee is brewed with fresh ground beans.